1204 – The town/area of Marlborough was officially established by the King of England John. 1703 – The First Duke of Marlborough is named. The honour is given to John Churchill who is widely considered the greatest military strategist in England’s history. On top of that he also ran the Hudson’s Bay Company and had the town of Churchill, Manitoba named after him. 1904 – The Toronto Marlboros Hockey Team challenge for the Stanley Cup, 28 years earlier than the Maple Leafs first Cup win. 1927 – Conn Smythe buys the Marlboroughs Junior A Team. 1929 – The Marlboros win their first Memorial Cup. 1929 – Hall of Famers Red Horner, Busher Jackson and Charlie Conacher are the first known Marlboro graduates to get bumped up to the NHL team. 1931 – Toronto Marlboro minor hockey is played for the first time. The current Marlies Minor Hockey Organization (GTHL) will be celebrating their 75th Anniversary next season. 1937 – The original Hot Stove Club is formed. It’s purpose is to raise funds for Marlies minor hockey. 1950 – Led by George Armstrong, the Marlboros capture the Allan Cup. Armstong scored 19 goals in 17 Allan Cup play down games. 1964 – The Marlies win the Memorial Cup and the Maple Leafs win the Stanley Cup. To date it is the only time that the Memorial and Stanley Cups have been presented in the same building as Maple Leaf Gardens played host to both trophy presentations. 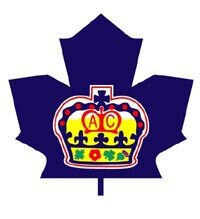 1974 – Head Coach George Armstrong leads the Marlies to their final Memorial Cup win. 1989 – The Marlies end their association with the Maple Leafs, move to Hamilton and become the Dukes. Harold Ballard grants permission to Marlies Minor Hockey to continue with the use of the name and logo. Steve Thomas is the last Marlie to play for the Maple Leafs. 1991 – Two years later, the Hamilton Dukes relocated to Guelph and became known as the Storm. Guelph continues to play in the Ontario Hockey League (OHL). 2005 – The St. John’s Maple Leafs, AHL affiliate of the Toronto Maple Leafs, relocate to Toronto and are renamed the Marlies. They begin play at the Ricoh Coliseum. Colin Murphy scores the first goal for the Marlies on October 8 on the road against Rochester. In their first ever home game, the Marlies beat Syracuse 5-2 on October 12. 2012 – The Marlies win the Robert W. Clarke Trophy, awarded to the Western Conference champions. For the first time since returning to Toronto, the Marlies compete for the Calder Cup. 2015 – The Marlies begin competing in the Eastern Conference. 2016 – The Marlies are awarded the Macgregor Kilpatrick Trophy, given to the team that finishes the regular season with the most points or highest points percentage. 2018 – The Marlies captured the Macgregor Kilpatrick Trophy as the American Hockey League’s regular-season champions. 2018 – The Marlies win the Richard F. Canning Trophy as the American Hockey League’s Eastern Conference champions for 2017-18, claiming the title with a 3-1 victory over the Lehigh Valley Phantoms in Game 4 of their best-of-seven series. 2018 – The Marlies win their first Calder Cup after a 4–3 series win over the Texas Stars in the finals.